It’s time to tie the knot and settle down, enjoying a peaceful life spending those mature, honest years in peace and quiet. Look no further than our ever popular Stag and Hen RIB experiences! Say ‘Au revoir’ to the single days with the ones who will send you off in style. Your group will set sail on the trip of a lifetime, surfing the waves at a nerve inducing 35mph! Don’t even think about cold feet as our trademark Thames Rockets medleys flow through the on board speakers that will have you and your guests grooving in your seats. It’s not the getting married that is stressful – it is arranging the send-off! 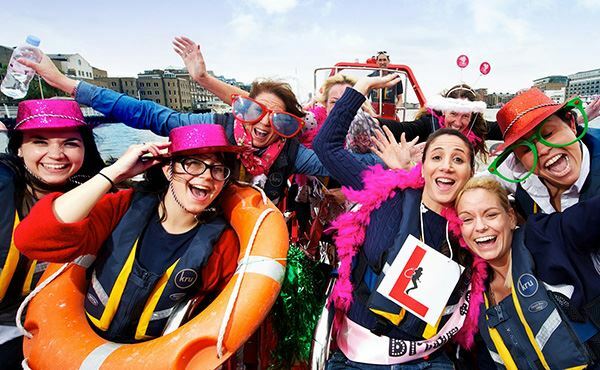 Don’t worry, our bookings team will walk you down the aisle from planning through to booking, ensuring all those special extras are noted, making this the ultimate Stag or Hen party which all others will want for themselves! We can ensure your own soundtrack is played, and even tip off your guide to reveal the stories the bride or groom never wanted to hear again! Thames Rockets know that it’s the small things that speak volumes. Our super funny comic guides are there every step of the journey with their off-beat humour so if you are warming up for the night ahead or clearing away the cobwebs you will leave us fired up for whatever is next on your agenda.